The iPod shuffle was Apple’s answer to a budget iPod, even though it was still quite pricey in comparison to other budget MP3 players. The first generation Shuffle, released in 2005, looked like a large USB flash drive that was designed to be worn round the neck with a lanyard – great for those on the move. It was the first iPod to use flash storage rather than a hard drives, followed by the iPod nano later that year. However, I didn’t take to the first iPod shuffle, and it wasn’t until Apple revealed the second generation in 2006 that it really got my interest. The design was a huge change over its predecessor. It was one-third of the size, made of metal, available in a range of colours (although only in silver initially), and its killer feature was the strong clip on the back for attaching it to your pocket, clothes, or bag. While the first generation only came in 512 MB and 1 GB models, the second generation came with 1 GB on release, with a later 2 GB model being offered. However, this new size came at a drawback. While the first generation had a built in USB socket, the new version didn’t – it used a special mini dock that had an adapted 3.5mm jack plug on it. 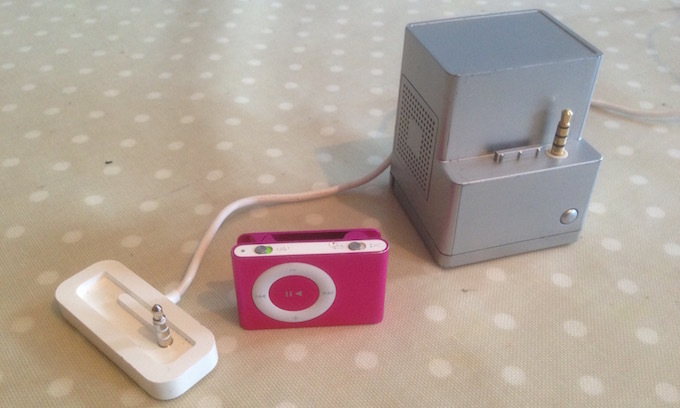 This is how you sync and charge your Shuffle. The front had the same play/pause, volume, and track controls as before. The top has the on/off switch as well as a switch to enable/disable the shuffle feature. The bottom had the jack socket. Sound quality and loudness varies across all iPods and iPhones, and the quality out of this tiny little beast is amazing. Heavy bass well balanced with superb treble, coupled with extremely high volume, makes listening to music an absolute joy. It is easily one of the best sounding iPods I have ever used. I use mine with Apple EarPods. While some might not class them as great, for the price I think they offer superb sound quality – as well as being very comfortable in the ear. It’s a Shuffle. It has no screen. I don’t understand people who complain about it. It is what it is, and it has a unique target market. To me, the lack of screen offers distraction free listening. You clip it to you, press the play button, and go about your every day business. The battery is amazing. The lack of anything fancy is reflected in a music player than can last you over a week on a single charge. Apple state 12 hours of continuous music playback. I had one a few years back – I wanted it to accompany my iPod photo. I used it mainly for playing dance mix tapes or when I was in the mood for playing an entire artist’s collection. Something that didn’t require spending time decided what to play. I actually ended up using it more than my large iPod. It was easy to pick up and go and always had some charge in it. The tiny size was a bonus too rather than having a chunky Photo in a belt case strapped to my hip. Plus only having 1GB it took only a few minutes at most to fill it. When my kids were looking for music players I instantly thought of the second generation iPod Shuffle and they loved them. The third generation changed yet again, having no buttons on the device, it came with special ear phones with built in controls. The fourth generation went back to the same design as the second generation – controls on the front and a clip on the back – only a little smaller, longer playback time as well VoiceOver. However, these come at a massive price hike over the second generation offering very little extra. A great little gem that is often over looked and now can be picked up for very little money. I still have one as a back up music player and I even have a mini Cube speaker system to go with it. Grab one and have some fun.